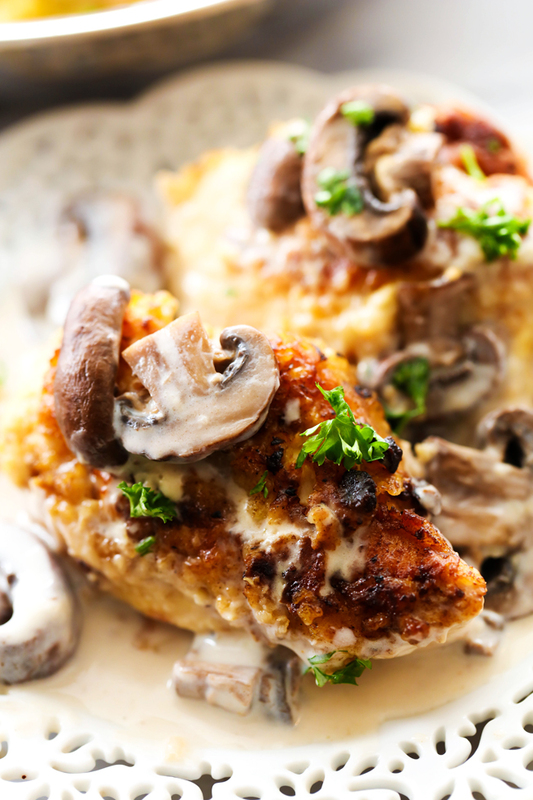 A delicious battered chicken that is first pan-fried then baked and topped with a creamy mushroom gravy. This is a true restaurant quality dinner that will quickly become a new family favorite! I have said it before, and I will say it again, mushrooms are HANDS DOWN my favorite vegetable! Whether they are stuffed or sautéed, I could eat them every single day! So after making my mom’s CHICKEN PAPRIKA for all of you and having it become and instant favorite with my readers, I knew a mushroom version had to be made. I seriously adore this recipe and so did my family. 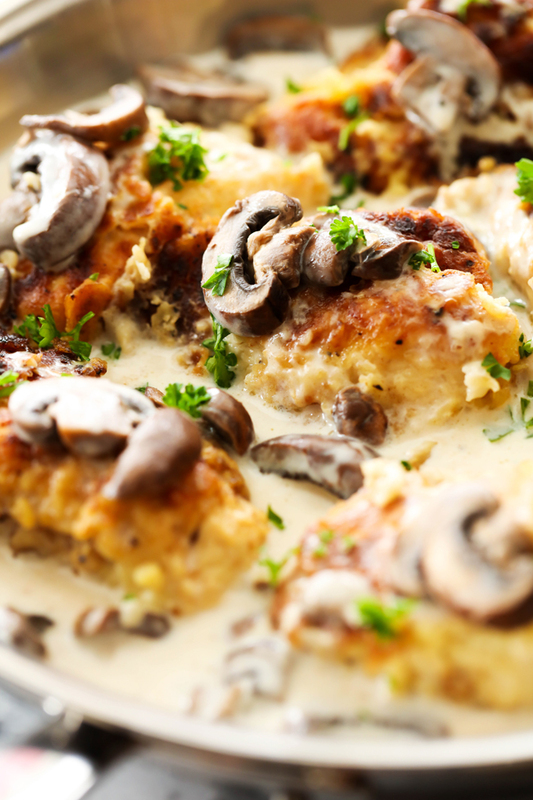 The creamy mushroom sauce is packed with such a savory and unbelievable taste and compliments the chicken so perfectly. 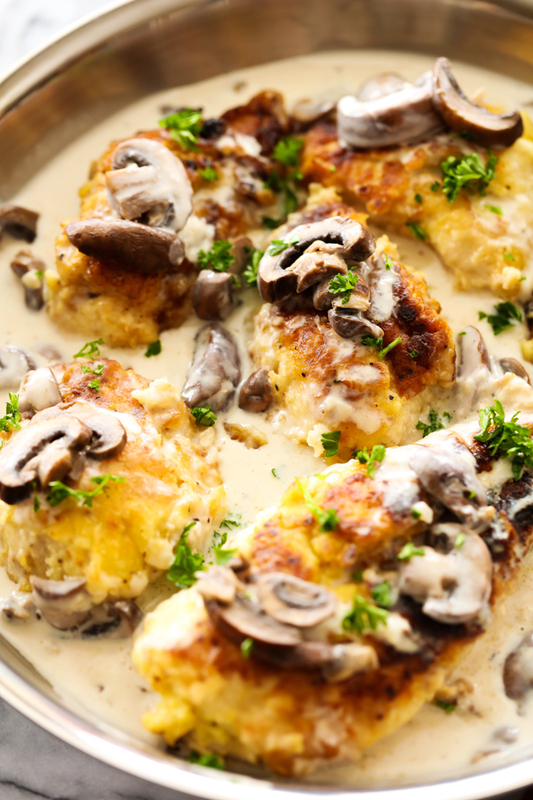 The tender mushrooms within the gravy provide an unforgettable and undeniably exquisite bite. I love this chicken because it is battered and then pan-fried to give it such a beautiful brown and crispy outside. Then it is baked to finish off cooking the chicken. n small mixing bowl, combine eggs and minced garlic. Pour egg mixture into a zip lock baggie and add chicken. Seal bag and coat well. Marinate chicken for at least 3 hours. In a large skillet melt ¼ cup butter. Add mushrooms and garlic salt. Cook on medium high until mushrooms are tender. Drain mushrooms well. Set aside. Add ½ cup flour mixture you used to coat your chicken in to the melted butter. Cook for 1 minute. Slowly add the milk and the half and half and stir quickly using a flat wire whisk until smooth. Season with salt and pepper. Stir until gravy comes to a soft boil and thickens. I garnished with chopped parsley. This looks so yummy! I am new to enjoying mushrooms. I had a problem with their texture for so long, but they can really up the flavor of a dish! Tried this last night for my family & they all said it was excellent!! Can't wait to make it again for our next big family gathering! I really want to make this .. but just checking to make sure the gravy has 2 cups of milk plus 2.5 cups half and half...so 4.5 cups of dairy in total. It seems a lot. Is this correct? This recipe is amazingly delicious!